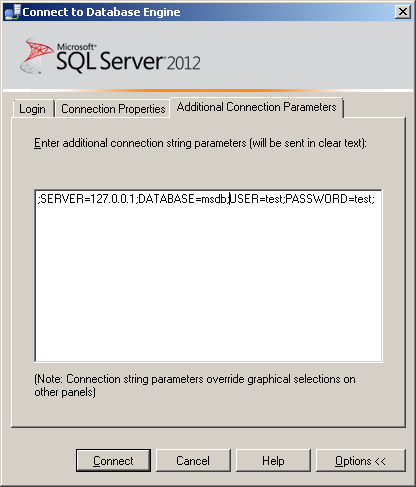 The Connect to SQL Server Management Studio presents a new Additional Connection Parameters Page. Use the Additional Connection Parameters page to add more connection parameters to the connection string. In Management Studio, on the Query menu, point to Connection, and then click Connect. In the Connect to dialog box, click Options, and then click the Additional Connection Parameters tab. What is the use of Additional Connection Parameters page ? · Additional connection parameters can be any ODBC connection parameter. · Additional connection parameters should be added in the format ;parameter1=value1;parameter2=value2. · Parameters added using the Additional Connection Parameters page are added to the parameters selected using the Connect to dialog box options. · The last instance of each parameter provided overrides any previous instances of the parameter. Parameters added using the Additional Connection Parameters page follow and replace the parameters provided in the Login or Connection Properties tabs. 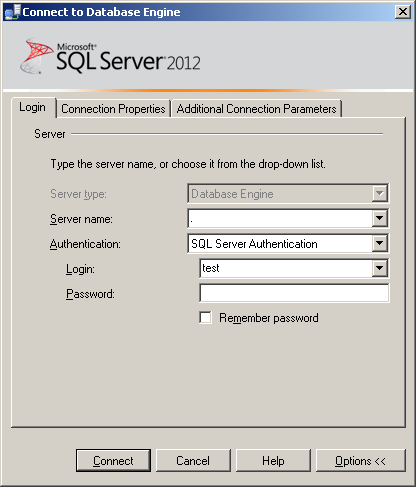 For example, if the Login tab provides SERVER1 as the Server name, and the Additional Connection Parameters page contains ;SERVER=SERVER2, the connection will be made to SERVER2. · Parameters added using the Additional Connection Parameters page are always passed as plain text. · Do not include login credentials and passwords in the Additional Connection Parameters page. They will not be encrypted when they are passed across the network. Use the Login tab instead. · You can use it for both Database engine Services or Analysis Services. 2) We have enter, Server Name, database name, User Name & password like parameter in Additional Connection Parameters Page & we connect successfully on MSDB database with test user.